It was April 1970 after almost one year of training when Dad and Delbert Smelser took me to Memphis to catch a plane to Seattle, Washington where I processed at Ft. Lewis and then was off to Vietnam on Tiger Airlines. We went by way of Anchorage, Alaska; Osaka, Japan; and, then to Cam Rahn Bay, Vietnam. The plane was full of friends from the NCO School. We had a good time on the 14-hour trip over. 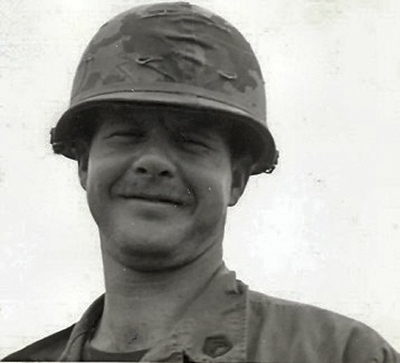 One soldier, Clyde Rennie, thought that as soon as we stepped off of the plane, we would be handed an M16 and we would run to the bunkers for safety. It was a quiet arrival, like any other Air Force base, but we were met with oppressive heat. In the area of Vietnam where I was assigned, most of us were assigned to the 101st Airborne Division. I was assigned to Charlie Company, 1st Battalion, 506th Infantry Regiment, 101st Airborne Division, (C Co, 1/506th) We were know as an airmobile unit because we used helicopters to move us from area to area in what were known as combat assaults or CA's. The first week there was spent in training to become familiar with how the 101st worked. The training was mainly to give us time to become acclimated to the country. SERTS (screaming eagle replacement training school) training took place at Camp Evans, near the town of Phong Dien where the 1/506 was headquartered. The Division HQ was about 30 miles south at Camp Eagle at Phu Bai near the old Imperial City of Hue. Camp Evans was more primitive than Camp Eagle. Our area had no running water. The shower was a pickup truck bed of water that was filled once a day. The latrine was an outhouse with half barrels of diesel. Someone, usually a private, assigned to drag the drum out of the trap door in back of the latrine and burn the barrel's contents each day. This same system was used on firebases across the country. In our company area we had sheds with screens and camp-type folding cots where we were supposed to sleep when in the rear area. I slept in there one night and a rat ran across my shoulder so I moved my cot outside where it was cooler and slept there. I did not sleep under a roof for the next six months. Charlie Company was out in the field when I got to my new assignment. SSG Bodo (Billy Bozarth) issued my poncho, poncho liner, M16, rucksack and air mattress. The typical rucksack at re-supply would weigh more that 100 pounds. It contained 25 boxes of C rations (canned food), 12 to 15 LRRP rations (freeze dried food), 12 to 14 quarts of water, 21 magazines of M16 ammo with 18 rounds each, another 21 clips of ammo to reload the magazines, 100 rounds of M60 machine gun ammo, 2 claymore mines, 6 fragmentation grenades, 2 white phosphorus grenades, 8 smoke grenades and extra PRC-25 radio battery, one block of C-4 explosive and one small rocket (that I loved to use called a LAW-light antitank weapon). There was also a rain jacket, a poncho and poncho liner, a jungle sweater to sleep in on the cold nights in the mountains, and one small ammo box with your personal stuff such as letters from home. The company came in for a hot meal and picked up the other replacements and me and went back out the same day. I was assigned to the 3rd platoon and we all went out to Fire Support Base Rakkasan. Zippo took my air mattress and cut it to shreds; he said it made too much noise in the field. The sling swivels on my M16 were also broken off because they would flop and make noise when we were moving. I was made platoon sergeant of third platoon and we were off to assist Delta Company for a week. After three weeks the Platoon Leader was wounded and I became the new Platoon Leader of 3rd Platoon. I was with the 3rd platoon until September when I was assigned as Platoon Sergeant to the 1st platoon. We stayed in the field for months at a time. The longest stint was 58 days with no shave or shower. We just took off the old dirty clothes we had worn for a week and sent them back in and put on the clean ones that we wore for the next seven days until re-supply. When it rained, we had a rain jacket we could put on to try to stay dry. Around 3 p.m. we located a night defensive position, NDP, and dug fighting positions chest deep and wide enough for three men and prepared for the night. We slept on the ground in one or two hour shifts; rotation between watch was a serious matter and problems did not happen often. Each night I called in artillery fire from the nearest firebase where the artillery units were located to mark three or four defensive fires that were numbered and used to start artillery fire missions in case of contact during the night. These numbered locations also served to verify our positions that I had reported form the map I carried. For fire missions I would give our location and request artillery to explode at a map coordinate I gave them. I would then direct the artillery rounds to land where I wanted it within a few hundred feet of our position. We also had an ambush out on one end of the trail with claymore mines along the trail to be blown if contact were made. As you left the site, you would then shoot your gun and get back to the NDP ASAP. In the other direction we had a listening post of two or three men that did what the name implies to protect the main unit from surprise. We ambushed them at night and they ambushed us during the day. I was ambushed three times but didn’t receive so much as a scratch. In early December I became the NCOIC (noncommissioned office in charge) of the logistics pad, sending resupply to the field at Cam Evans until my departure in late January 1971. I returned home to Missouri on February 1, 1971. 3rd platoon of Charlie Company had been attached to Delta Company after Delta was hit yet again. We had been walking point for Delta Company for about five days when we were suddenly ordered to secure a hill for an LZ. Engineers were on the way to be inserted to blow the LZ on a hill top that sat just under a taller hill that might have been a better choice. The engineers were coming in on a Chinook and the supplies were on a Huey just behind them. We had to rush to beat the choppers to the location. We arrived at the LZ and were checking the area and positioning ourselves around the hilltop when the choppers came in. The lead chopper immediately took fire from the saddle of the hill to our front. The fire came from the right side of a saddle on the ridge line. I could see muzzle flashes from two weapons coming from the foli age. We returned fire and I extended a LAW and fired at the spot where I saw the muzzle flashes. I was right on target with the direction but a little high in the trajectory with the rocket going right through the trees. The firing stopped immediately. I don’t know if it was the rocket or the Chinook shuddering and falling to the right of our location that ended the fire. The Huey was still on sight and offered another target, which leads me to believe it was the rocket that ended the contact. Had the Chinook come straight down several of our men would have been injured or worse. We quickly organized the platoon to check out the top of the other hill. Something that should have been done before the helicopters came to our location. We went up the higher hill and found a trail that went along the top of the ridge. We checked down the trail to the right and found nothing. We then went back up the trail to the left of where we came in and saw that the trail went into a bamboo thicket. Terrible Tom and I volunteered to check it out. With Tom in the lead we decided to go through the bamboo rather than follow the trail that went first right and then left. We could see that the bamboo was not deep. We got side by side and on his signal burst through the bamboo. Fortunately there was no one on the other side. Fortunate because my canteen caught on a bamboo pole and I was delayed and distracted upon my entry into the most perfect bunker complex ever encountered. The ground under the trees was scraped clean. The tree canopy made a perfect cover from the air. Around the perimeter was a bamboo wall. The trench that went from bunker to bunker was covered with openings for entry and exit. In the middle was a large hut that was empty. The latrine was a hole covered with poles that offered only a hole in the middle for use by the soldiers. There was no running water but the complex offered all the other comforts of home in the jungle. After checking the area we went back to our assigned hilltop and received the explosives to blow an LZ for our extraction and the extraction of the rest of Delta Company whom we were assigned to at that time. For five days we had walked point for Delta Company encountering enemy and enemy bunkers. It became a joke when every bunker we reported to the Delta Company commander would get the response “yes I knew it was there, I just forgot to tell you.” To this day I hate to hear that phrase which was apparently a byword or SOP for Ranger. In my 6 months in the field my platoon leaders were SSG Steve Smith (less than 30 days), me, LT John Georgiton (less than 30 days) and then me again. I think that the time Zippo was in the field lieutenants went elsewhere. I do remember Fido, Peanut, Duck, John and my replacement that the men call Sir, all lieutenants during my time with Charlie Company. Please don't make this a book about the Officers of Charlie Company. In Charlie Company's glory days (i.e. Zippo's command) that would be a very short book. Ranger and I were together again when you were in the field when Zippo was on R and R. I was on Kathryn waiting to join C Company after returning from the hospital in Cam Rahn where where I was treated for jungle rot. 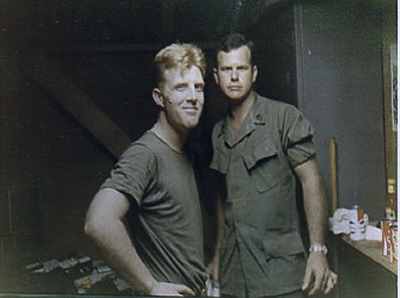 When I did rejoin Charlie Company I went from 3rd to 1st platoon as platoon sergeant with John Georgiton. I watched the hospital, that you guys found that had running water, burn from the firebase. I was in the hole next to the one that blew up and killed the two men of Delta Company on Kathryn. I saw one of the guys lying in the wire the next morning with his hand gripping the wire and his head lying on his hand to keep from cutting himself where he landed after he was blown over the hill to the other side. I am sure he would have died anyway but Delta Company did not see him lying on the wire right in front of them from 10 p.m. till daylight. How can that be? Ranger decided that the Scouts had planted a booby trap and that was that, no questions were ever asked. On Ranger’s orders I was also the only person on the firebase required to carry his weapon and wear his steel pot in the chow line simply because he could [order that]. Those of us from Charlie Company were not allowed a share of the refreshments brought to the firebase for the men of Delta Company. Yes it is personal with Ranger and yes his former soldiers who survived think he is great and Zippo was a nut. They could not survive a data based conversation. Looking forward to seeing you at one of the reunions. I would like to add my side of the story about when Steve Smith was shot just to get it off my chest, again. It was a dark and stormy day. It had been raining for several days and we were off Maureen. We were in the NDP with a listening post as usual. Cico Rodriquez was on listening post and sighted NVA coming up the trail. Cico fired in their direction and came running up to the NDP. Steve Smith said let’s go get a gook and four of us took off down the trail with M-16s, seven magazines of ammo each and no frags. Steve was walking point; I was slack; Booker T Merritt was behind me and Cico behind him. Going down the trail rapidly we came to a bend going right. When we got to the bend the NVA opened up on us and Steve was hit right away. As Steve went down I went down with him. I turned to get the other two organized and saw them running up the hill. I knew Steve was hit and crawled over to him. I could see the bone in his right arm and the chunk of meat that was his muscle lay open. Steve was going into shock. I shook him and told him he was not hurt badly and for him to get out of there. He said he couldn't walk that he was hurt too bad. I told him he was going to be OK and that he needed to get out. As I took his seven magazines, his color started to come back and he started to move out up the hill. Just as he was struggling up the hill I looked forward to see an NVA coming through the brush to get Steve. I fired at him and he went down, I don't think I hit him. I provided cover fire for Steve as he moved out. I looked back to see Steve slowly going up the hill toward the NDP. I felt comfortable that he was going to make it. I continued to lay down cover fire until I realized I had only one magazine left. I asked myself what am I going to do now. I was looking for a way out when a bag of M-16 magazines landed at my feet. I looked around to see “Grub,” SFC Frank Foronda and others coming to my rescue. We continued the firefight until I saw movement on the right and rose to my knees and fired a LAW into the brush where the movement came from. The firefight was over immediately. We went back up the hill and arrived just as the rest of the Company was coming in to reinforce us. Zippo sent the first platoon down the trail to secure us and to check out the area while the medevac came in, dropped Raider, and all the rest. Zippo sent me down the trail to first platoon to show them where we made contact. Before I got to them they were hit with their point man being wounded. Before I went down I walked past as SFC Foronda was on the radio. I heard him recommend me for the Silver Star and say it was the bravest thing he ever saw. Just then Zippo walked by and nonchantly said, "I think a bronze with a V is enough." Foronda looked shocked that he would do that and that was the end of that. I was told later by Doug Ketterling that the recommendation for a bronze with V was sent to Phu Bai and was returned to be reconsidered or maybe there was mistake in the typing, who knows. Thirty five years later when I first saw Steve Smith, after all those years, I went out to visit Steve and Liz for a three day visit. On the way back to the airport, a two hour drive, we were almost there and Steve turns to me and says I have got to ask you this question; did you zing me back in Nam? After I quit laughing I said no I did not. He explained that he did not think so but it had always been on his mind. Well it has been good to tell you my side of the story. Thank you again for your patience and what you are doing with our stories. I look forward to seeing you at Bruce's place in July.